Ice fishing is most often a white, blue and black world. The intensity of these colors can get a little trying on the eyes. The blue is the clear winter sky, the black is the dark water around your drilled circles and the white — that belligerent and unwavering white —well, you can figure that out. With this limited palette around me, I’ve come to enjoy watching the vibrant colors on a small sonar screen. It certainly breaks up the monotony. The ice blindness, if you will. And the colors I enjoying seeing the most, at least on the circular dial of a Vexilar, are red and green. The red, at the bottom third of a low-gain reading, indicates an uneven bottom, hopefully a plethora of weeds, along with my jigged bait among the jungle. The green indicates an advancing fish, or fishes. They come in slowly at first, with a weak signal, then the band which displays their presence grows in width, meaning they’re heading towards my bait. But the moment and color I like best of all, is when the green completely surrounds the red, covering it up. This quick change of hues translates into a stiff flexing of the rod and then a steady but rapid turn of the reel handle. It all ends hopefully in a slab crappie that comes to the surface, one that joins me in the world of white and blue and black. And that in a frigid nutshell is an important way that a sonar unit can improve your iced-crappie fishing. While it may be putting the ice wagon before the horse, the ability to see a strike coming and to quickly react to it is crucial to this game. Imagine the opposite. Imagine not having a sonar, specifically a flasher, with you. You’re sitting on a cushioned bucket on the ice. It’s cold and you’re bundled in your iceman suit. There’s a bit of breeze which makes it a bit colder. Adding to that you haven’t had a bite yet. Your mind wavers; you start looking around. Unbeknown to you, down about 12 feet, a pod of crappie comes wandering in. They’re looking for food but so far haven’t found much. Then they spot your jig and the wormy bit of larva on the hook known as a spike. 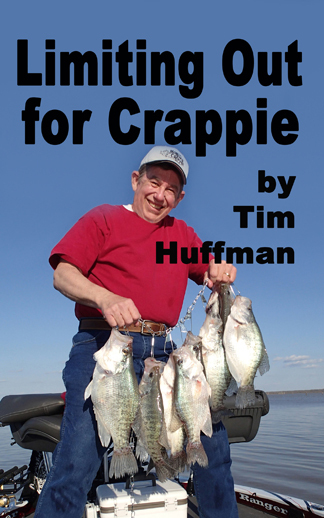 Still unbeknown to you, a fine 14-and-a-half inch crappie comes up to your offering and does what big, cold crappie often do, that is take the tiniest of nibbles like a debutant afraid to touch her food at a ball. If you were looking at your rod, you might see the mere smidgeon of movement at the tip. Perhaps even if you were staring at the flimsy tip you still wouldn’t notice it, because you’re shivering hand doesn’t translate the feel. And you continue to sit there wondering why the crappie aren’t biting. Well, the next thing that happens is that the 14-and-a-half incher takes a full bite and before you can bring yourself to believe it’s happening, that crappie has taken your bait and gotten away scot free. That’s what happens without a flasher. With a Vexilar it’s an entirely different scenario. Now with a red and green Christmas dial, you’re still waiting for a bite. Things are still slow — the sonar can’t change that. But suddenly, the dial lights up. From the corner of the transducer cone comes a small army. Now it really is Christmas on your sonar. You’ve been holding the rod and jig steady but with the advancing fish you decide to give it a slight jiggle; nothing much just a little waver. The lead crappie sees this and the action drives it temporary crazy. From a foot away it rushes to your bait and engulfs the jig and larva with a hardy swallow. Instead of being completely unaware that this happening, you now see the movie play right in front of you. As the colors change on the dial, you arch the rod with a sure hook-setting snap, and in that instant you’re raising a fine crappie to the ether. And with a sonar, things get even better. After quickly removing the crappie from the hook, you lower it down rebaited. Still in the vicinity is the pod of hungry crappie. They’re off to the edge of the transducer signal now, so the band on the flasher dial is thin and wavering. But that doesn’t matter, you give the rod another slight jiggle and another fine crappie comes over and takes the bait. That’s two crappie you’ve caught that otherwise might have gotten away. Should I go on with this lovely scenario? Another way in which a flasher will put more slabs on the ice is with an understanding of jig movement. The first time around the crappie responded to a little bounce, a little whisper of rod action. But that’s not always the case. Sometimes it takes a more vigorous motions of the bait to get crappie to bite. The flasher will help tell you that as well. Sometimes when sitting on my cold cushioned bucket, I’ve seen crappie come up to the jig and stare at it. It’s like they’re waiting for the jig do something, or not to do something. If you encounter stubborn slabs, the trick is to raise you bait over them by a foot or two, then let it settle back to their level on a tight or semi-slack line. Or maybe not fall at all and keep it at the level you raised it. 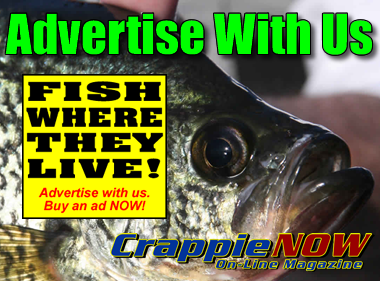 There is an odd truth with winter crappie and that’s if they rise with a bait, they’re probably going to take it on the rise, or on the fall. How high that chase goes — and it’s usually no more than a foot or two — it very difficult to determine without a flasher. In the old pre-flasherless days, you’d raise and lower your jig hoping you got it right. You often didn’t. But with a flasher you can watch crappie swim up, following the movement of your rod. Then you jiggle it slightly, a minor quivering of the tip. Often it’s a good trick to raise the bait just a few inches, jiggle the jig, and let it drop infinitesimally. 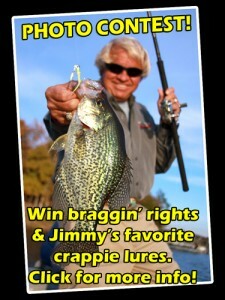 Don’t be surprised if the crappie takes it the milli-second it starts to descend. Whatever the motion that it requires to entice a crappie to strike, you can read what it might be on the flasher. Just don’t expect every crappie on the day you’re fishing, or in the general time or even in the same pod to react similarly. In fact, you often have to play with them, giving one fish a gentle rise and fall; another fish, a quick rise and steady hold or a whole variety of actions. 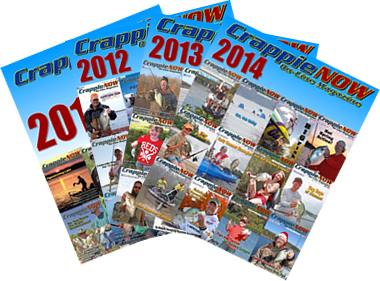 After all they are crappie, and it is winter. A sonar will help you make the determination. And now I’ll finally put the horse before the ice wagon where it belongs because the most fundamental of all messages you’ll be able to read on you sonar is the bottom structure. Turn down the gain. Turn up the gain. Eventually you’ll see weeds, eventually you won’t. Whatever the final adjustment, your flasher should give you a better understanding of what’s on the bottom. This reading alone will tell you where to place your jig, either above the weeds or below them, down against the bottom (when there are no weeds) or so much higher in the water column. You’ll have to study and understand your flasher’s readings but there is no single better way that your sonar will put more slabs on the ice. If you don’t already work with a flasher on the ice, try it. Once you figure out everything it can do, it will color your world.